Memorable but crowded! Read the detailed report for guidance on where it's best to stay in refugios vs. camping and how to book the refugio and camp tickets and transport. Weather: Even in February when the chance of good weather is greatest, the chance of rain and even snow on this circuit is appreciable on any day. The group needs to be well prepared with good raingear, warm layers and an attitude of taking weather as it comes! Leave yourself a backup option to spend a second night at Perros in case you can't get over John Gardner when you want to! Trail Conditions: The trails around Torres del Paine are in a rather sorry state with some notable exceptions. On the upside, the rickety ladders between Camp Paso and Refugio Grey have been replaced with three sturdy and stable suspension bridges. On the downside, there is no effort to move water off these trails and there is little infrastructure like waterbars or puncheon so there are extended patches of deep and unavoidable mud, worst between Dickson and Perros but also bad in places even on the 'front side'. The descent from Paso John Gardner to Camp Paso is very steep scree at the beginning, then essentially a streamcourse dropping over rocks and roots with the added hazard of old trail boards and support pipes, now with all the soil around them eroded away. Camps: The privately run camps all around the circuit have been improved with new raised tent pads and lots of 4-season tents for rent. THERE IS NO LONGER ANY NEED TO CARRY A TENT AROUND THE CIRCUIT! In fact, due to considerable wind damage to our lightweight 3 season tents on the Fitzroy circuit, I would advise that you rent the 4-season tents on offer. Just be sure you reserve your tent when you book your camps! Camp Perros has very limited space to eat inside (no food service) and many of the tent pads were flooded, though they had many rental tents available. Camp Paine Grande is exposed to a lot of wind, though new wind fences have been built to protect their rental tents. Camp Chileno is cramped and can be smelly and loud due to proximity to horses and refugio. Camp Cuernos is also cramped and I've been told that the toilets are disgusting but I haven't stayed there with a group. Note that you can't eat at the refugio if you camp at Frances - all the other camps allow you to buy the meal plan and eat at the refugio and this is WELL WORTH IT!! Also be aware that the camps run by CONAF (National Forest Service) now must be reserved in advance and groups aren't allowed to book at all. http://www.parquetorresdelpaine.cl/en/sistema-de-reserva-de-campamentos-1. IMPORTANT: YOU CAN NO LONGER BOOK YOUR GROUP AT CAMP PASO SO YOUR ROUTE MUST GO DICKSON-PERROS-GREY. LIKEWISE YOU CAN'T BOOK YOUR GROUP AT ITALIANO AT THE BASE OF THE FRENCH VALLEY! Refugios: Paine Grande, Torre Central and Grey are very luxurious and roomy refugios with great meals. Cuernos is a bit smaller but friendly with good food. Chileno is cramped and food ran out early. Dickson and Serron didn't have beds but their food service was good and lunches were delivered promptly upon request. Transportation: Trying to take the public buses from Punta Arenas or Calafate can prove VERY time consuming and you will lose precious hours and even days from your itinerary. 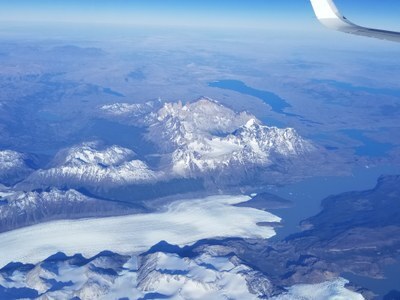 Organize a private transfer from PA to Las Torres and from Las Torres to El Calafate. Experience Chile (contact info below) can help you with this. Hosteria Las Torres can also arrange private vans. Luggage transfer and storage: Hosteria Las Torres no longer will store bags for groups starting/ending there - they say their storage space is too limited. We had to arrange with Experience Chile to store our bags during our trek and bring them up to Las Torres on our return day, for a considerable fee. No other good options other than to carry all your stuff around the circuit which is untenable. This route has become very crowded, though you won't encounter a lot of other parties while you're walking. It is not a solitary experience! Hosteria Las Torres is a fabulous place and if you can afford it I'd strongly suggest you stay a night there at the end of your trek (at the beginning too if you can swing it!) If you want the lamb barbeque for dinner you will need to reserve this in advance! NOTE: If you are not staying there the night of your arrival in the park they will no longer let you through the gate and you will have to walk an extra mile or so to Las Torres to start the trek. There is a very nice welcome center with small cafe and covered area to dress at the drop-off point. We added an hour walk to Mirador Cuernos and Salta Grande waterfall on our transfer day from Punta Arenas and this is a great way to give people the famous view across Lago Nordskjold to the Cuernos before they start. NOTE; Be sure your driver takes you the most direct way to Pudeto and NOT the long way around past Lago Sarmiento to the east - the long way around takes an extra 45 mins of driving on gravel roads each way. If you want to do the kayak trip on Grey Lake on the morning of the short day to Paine Grande, you need to book this far in advance. http://www.bigfootpatagonia.com/kayak.html. A walk to Mirador Grey (about a half hour from the refugio) is a lovely consolation prize with lots of iceburgs in the bay glowing blue. For all of the vendor contacts get in touch with the leader at cascadehiker@earthlink.net.